Moss and ferns abound on this fantastic and popular tour in Washington’s Olympic Peninsula. Over 150 varieties of moss, and somewhere around 15 types ferns live in our nations wettest place in the contiguous United States. The many shades of green entrance you. The Olympic Peninsula is very large, and has both a National Forest and a National Park. Because of it’s great size, we have designed a number of different tours on the peninsula. 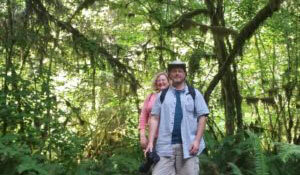 This tour, our Rain Forest Tour in Quinault, involves heavily wooded trails and moss galore. Because many of the largest trees in the world are here, you’ll see old growth forest, massively large trees, and mosses of various textures and colors. We chose this particular Rain Forest location because it saves you over 2 hours of driving time compared to the Hoh, which further away in the National Park. AND, it’s just as beautiful! Fewer people visit Quinault, making it a much preferred destination for feeling the serenity of the trails, forest, and water.